Midtstubakken will be completed in 2010. It will be used for ski jumping (normal hill) at the World Ski Championships in 2011. 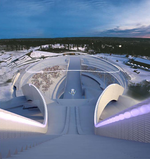 In september 2009, Hagbarth Vogt-Lorentzen, project manager at Terramar, held a status review of the major building project at Holmenkollen, together with a group of engineers and architects. It is plain to see that the arena is really starting to take shape.